This post is the final response in our round table on Peter Slezkine’s essay from our most recent issue. Be sure to read the entries by Stephen Hopgood, Kenneth Roth, Aryeh Neier, and Bart De Sutter. I would like to thank Stephen Hopgood, Kenneth Roth, Aryeh Neier, and Bart de Sutter for their thoughtful comments. De Sutter is right to point to the limited availability of the internal documentation of Human Rights Watch (HRW). Much remains to be discovered, and I look forward to learning more about the history of the Helsinki monitoring groups from de Sutter’s own research. 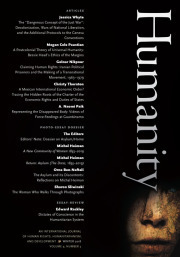 It seems to me, however, that the basic outline of HRW’s evolution can be discerned from an analysis of the available annual reports, grant applications, internal correspondence, and retrospective accounts, such as the one presented in Neier’s memoirs and, in brief, in his response to my article. An interpretation of open documents does not have to coincide with “official” history (as de Sutter seems to assume). HRW’s website, for example, represents the organization’s history as a fairly steady evolution toward an ever-greater coverage of human rights violations. In my article, I argue for a much more radical shift in the organization’s mandate. At least one important model, marked by national sections joined in an international federation and subordinated to a central secretariat (a structure promoted by the original Moscow Helsinki Group, attempted through the International Helsinki Federation, and associated with established NGOs such as the Red Cross and Amnesty International) had to be discarded before HRW could emerge in its current form. But the history of Human Rights Watch is not simply a story of change. Perhaps the most interesting aspect of HRW’s evolution has been its persistent efforts to reconcile (or equate) the American with the international. U.S. power was a necessary factor in HRW’s rise to prominence and, as Roth writes, the organization continues to rely on its “special access to Washington” in order to promote its human rights agenda — a value system it has, at various moments, explicitly identified with the foundational tenets of American democracy. At the same time, HRW seeks to maintain its independence, reporting on the United States’ domestic abuses and regularly criticizing its foreign policy. In recent years, the organization has greatly diversified its sources of funding and the national composition of its staff. It would appear that Soros’s appeal has been heard and his money well spent. But the progress of these efforts has hardly satisfied the organization’s critics. For Hopgood and many others, the form of internationalism represented by Human Rights Watch and, indeed, the very human rights HRW promotes remain essentially American. In its origins, HRW’s internationalism is indeed American. Instead of replicating a purportedly universal model in a particular national context, the organization internationalized by universalizing the jurisdiction of a nation it had always believed to be exceptional. But the degree to which HRW remains in some sense American may be of secondary importance. The larger problem the organization must resolve is how to justify the global influence of a particular set of individuals, an issue made more evident by HRW’s minimal membership. For some time, the organization explicitly embraced the notion that membership in a national group provided the primary basis for defending (and interpreting) the interests of its citizens. The organization situated itself within a network of domestic rights defenders and justified its international reach by appealing to exceptional circumstances. Today, HRW seems to have transcended the limitations of this model by replacing the solidarity of the nation with that of humanity as a whole. But proving primary belonging to this broader category is no simple matter. If Human Rights Watch is international (and no longer American), it is precisely because it has 77 different nationalities represented among its staff; if the values that Human Rights Watch promotes are universally applicable, it is because they have been ratified by the relevant representatives of national governments; and if HRW’s mandate is global, it is because the organization is connected, as Roth puts it, to “domestic activists on the front line of virtually every country where we work.” HRW may have abandoned its own explicit connection to a particular country, but it appears to operate in a world in which legitimate representation of group interests is still largely defined by national boundaries.